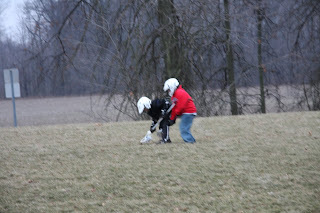 Ryan had his first Lacrosse practice last night. He was so excited!! 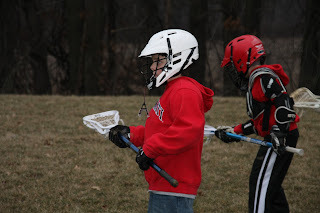 There are 12 boys on his team and they are all new. They were so cute practicing. Ryan absolutely loved it!! He was so muddy when he got finished, again he loved that!! What fun! He is going to have a ball I'm sure. Can't wait to see pics of his games! Oh that is cool. We HAVE to come to one or more of his games. Give me the dates and times when you get them and we will come cheer him on with signs and everything. Sammy's fav soccer games have been when Ryan has attended the games. Looks like fun! 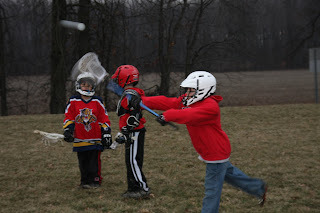 I always thought LaCrosse looked like a fun sport. 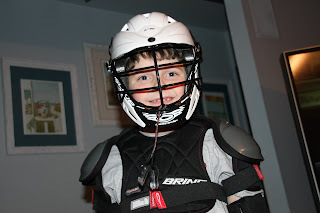 He looks very cute in his gear.